How to Tie Skip's Furry Dragon—Simplified! 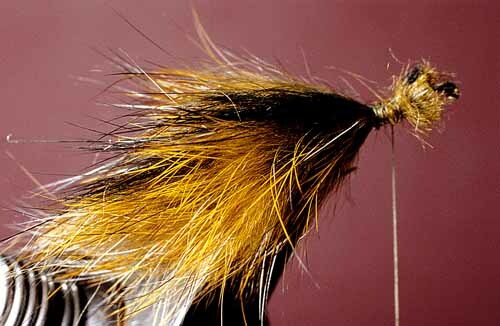 In Skip's Furry Dragon, Part 1, fly fishing author and master tier Skip Morris discusses why it is important to target trout with dragonfly nymph imitations in lakes, and how to fish them. In Part 2, he goes into clear and simple detail on how to tie his favorite imitation of these nymphs, the Skip's Furry Dragon. In this section, Part 3, Skip reveals a simplified tying version of his Furry Dragon...easier to tie, and just as effective as the original. Hook: Heavy wire, 1X long (standard nymph hook), sizes 10 to 4. Thread: Dark-olive or dark-green 8/0, 6/0, or 3/0. Abdomen: Three (or four) bunches of dark-olive rabbit fur (from a Zonker or crosscut rabbit strip or whole hide) up the rear two thirds of the shank. Atop each bunch, a tiny bunch of black rabbit. Eyes: Black Vernille or Ultra Chenille bound crossways and trimmed on the ends. (A dot of head cement on each end is optional, to add toughness.) Or black plastic barbell eyes. Thorax and Head: Rabbit fur, dubbed. The fur should be about the same color as the body-fur. 1. Instead of building three sections of green fur, flanked with brown and topped with black, build three sections but make them of olive (or brown-olive) fur topped with black. Olive rabbit fur on the hide seems considerably easier to find than dark-green and medium-brown, and the new way is faster because the step of adding the brown fur is dropped. 2. 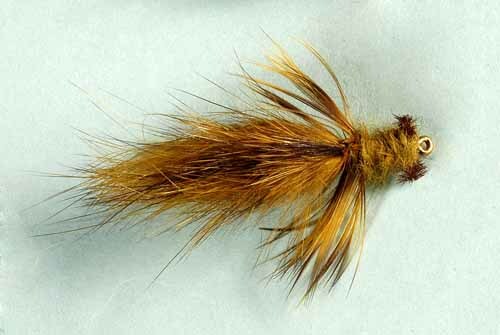 Instead of building the whole pheasant-wing-case-tail complex, just strip the base of a green, olive, or brown (all three colors seem equally effective) hackle or body feather, bind the feather by its stem to the shank at the front of the body, and wrap it in a few close turns. 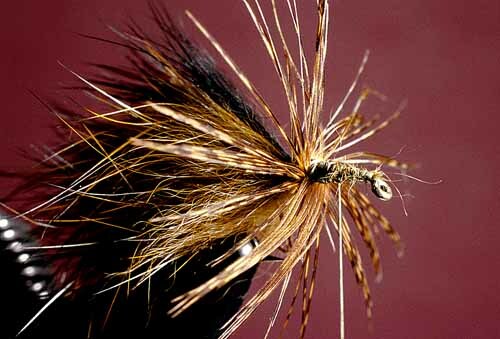 My favorite is a dyed-green hen-saddle hackle bound just ahead of the body, wrapped back to the body, then secured and reinforced by spiraling the thread forward through the turns of hackle. 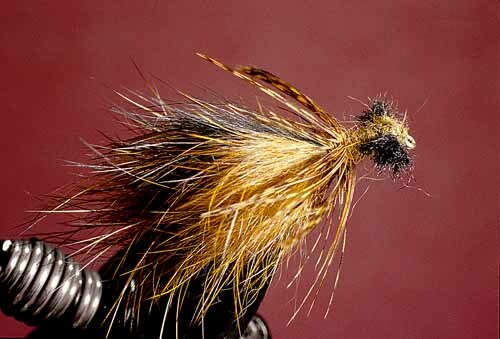 Make a short wing case of pheasant if you wish, but the trout won't miss it if you don't. 3. 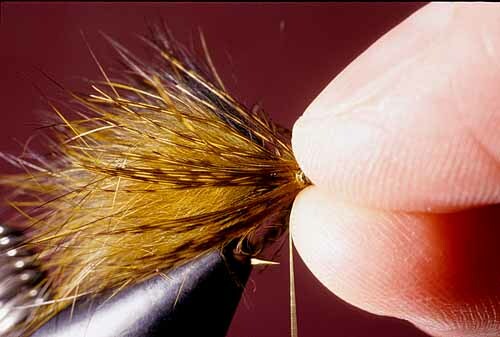 Pinch the hackle or body-feather fibers so they sweep back—this will keep them out of the way to make the next steps easy to perform. 4. Dub up the hook's shank, bind on the eyes (use pre-made plastic barbell eyes if you wish), dub around the eyes, whip finish the thread at the hook's eye and coat the whip with head cement.